Is This The Greatest About Us Page Ever Written? This is an era without information gatekeepers, and every company needs to think of itself as its own TV station, magazine, and newspaper. This puts a spotlight on businesses’ ability to tell their own stories with nuance and impact. Those stories don’t have to be solely contained on your blog, or your YouTube videos, or other common vessels for swashbuckling corporate tales. Even the humble and oft-maligned About Us page can be a scintillating source of content and brand-building, if you free yourself from the boring, factual archetype. Like these guys did…..The Royal Plantation Resort in Ocho Rios, Jamaica created the best About Us page I’ve ever read. It’s closer to a Jackie Collins novel than a fact sheet. I’ve included some of the juiciest bits below, but click through to read the whole thing if you dare. “Plantation Inn’s very first manager was the universally respected Cy Elkins, who brought over many of Jamaica Inn’s best staff to the new hotel. At first this symbiotic arrangement seemed to work out well. But, when Cy left Gloria for another love, she never forgave him, both for his desertion of their marriage and his pilfering of Jamaica Inn’s treasured staff members! Over his time at the inn, Cy’s greatest coup took place when he somehow managed to obtain the services of Theophilus Caiaphas Palmer of Ocho Rios, one of only two Jamaican Sommeliers to have trained in France under the watchful eyes of acclaimed oenologist, Alex Lichine. Sydney Attwood, an effete, haughty, handsome and erudite Englishman replaced Cy after he had flown the coop, and the island, with his new bride. While Sydney, a former BBC employee in London, impressed many with his rather plummy accent and his perfect Oxford English, his management style left a lot to be desired! Treating Plantation Inn as his personal fiefdom, Sydney expended great sums of money on whimsical purchases, such as crested shower curtains from Hong Kong and a grand piano—without authorization. Not surprisingly, Sydney’s personal life was also quite indiscreet and one of his more glaring indiscretions finally ended his somewhat tarnished career at the hotel. He was succeeded as manager by John Cota, who worked tirelessly and successfully to bring some order out of the chaos left by his predecessor. Throughout the years, this resort has always been a magnet for the rich, famous, privileged, powerful, aristocratic and worthy, such as various members of the British Royal Family, the Earl of Mansfield and Mansfield, Sir Winston Churchill, Richard Nixon, Pierre Trudeau, Prince Ernst of Hanover (the husband of Princess Caroline of Monaco), the younger brother of the Maharajah of Jaipur, Mr. & Mrs. Stanhope Joel, of the South African diamond dynasty, and Mrs. Coretta Scott King, the widow of Martin Luther King Jr.
Artists, art patrons and art lovers have always found a home at Royal Plantation, where, to this day, fine art weekends with world-renowned local artists occur monthly and exquisite, original paintings line the walls. The tradition began in the 1950’s when English playwright, Noel Coward, would often bring guests here to dine from his nearby home, Firefly, on the inn’s gourmet cuisine. And popular author, Ian Fleming, would take breaks from writing his James Bond novels and come here from his house, Goldeneye, to enjoy the amiable company and gourmet fare. Richmond Barthe, the renowned American sculptor, frequently stayed here as well. 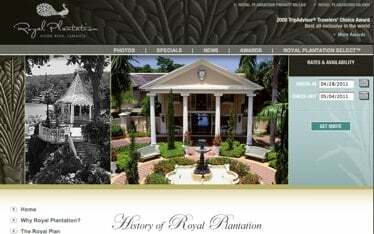 In the 21st Century Royal Plantation’s reputation for excellence and opulence has been resuscitated and rejuvenated by its current owner, the internationally renowned hotelier and entrepreneur, Gordon “Butch” Stewart, who purchased the inn in 2000 and rapidly restored it to its former glory. A native of Ocho Rios, who spent his formative years in this very town, Stewart spent his childhood dreaming of owning this sublimely sophisticated resort—today his wishes have been fulfilled beyond even his wildest expectations. Wow! International intrigue + Dashing characters + Indiscretions + Celebs = delighted reader. Most companies would go out of their way to NOT talk about the embezzlement schemes of their former owners, but the Royal Plantation revels in the crazy of their past. Awesome. I don’t have a Jamaican vacation planned just now, but I’ll remember the Royal Plantation down the road. Until then, I’m going to rewrite my About page. How about you?